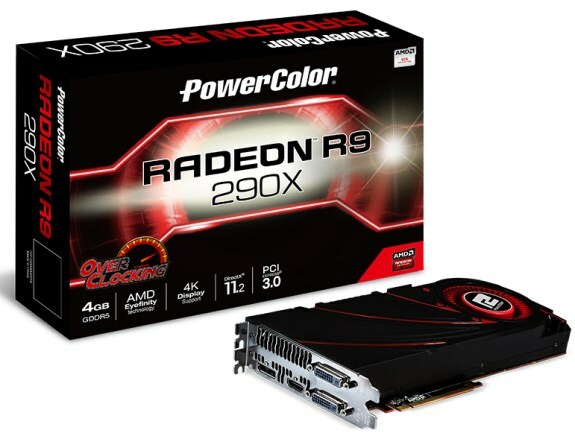 PowerColor introduces its Radeon R9 290X cards. These cards feature a 1030MHz core, a slight overclock of 30MHz versus the stock clockspeed. TUL Corporation, a leading manufacturer of AMD graphic cards, today introduces the most high end products at R9 series, the PowerColor R9 290X. Being a total new GPU, the R9 290X is packed with dozens of latest technology; gamers now can get intense gaming performance and unrivalled image quality with lifelike imagery by utilizing the newest DirectX® 11.2. Also with the support of Windows 8.1, the PowerColor R9 290X deliver all the benefits for Windows users. Most important, the new card supports 4K ultra HD gaming in single and multi-display configurations, users can get the most out of every square inch of screen. Being the highest end of R9 series, we overclocked the core of R9 290X to 1030MHz, and together with 1250Mhz memory. What’s more, it equipped with high standard 4GB of GDDR5 and new 512-bit high speed interface, delivering more speed and higher bandwidth for high-performance GPUs. Also, the PowerColor R9 290X features 2816 stream processors offering massively parallel computing power for heavy application. The brand new GPU combines all the latest technologies in R9 290X. Users now can find the TrueAudio technology at R9 290X, it’s the first discrete GPU featuring programmable audio pipeline, delivering a unique audio user experience on PCs. With AMD CrossFireTM technology, users can get exceptional performance scaling with a second GPU. Thanks to AMD Eyefinity technology, gamers can enjoy the ultimate immersive gaming experience with innovative “wrap around” multi-display capabilities. This time, PowerColor is going to bundle the biggest game title of year, Battlefield 4TM with our R9 290X, going to satisfy all demanding users. The Battlefield 4TM, fuelled by the next-generation power and fidelity of FrostbiteTM 3, provides a viscera and dramactic experience unlike any other, with dynamic destructible environments, epic vehicular combat and the chaos of all-out war.